We chat with a full-service production company that offers professional DJ, karaoke, MC, sound, lights, entertainment and more — all under one rockin’ roof. Read on for details. Allen Walker knows that planning a wedding can be stressful. That’s why his company Big Daddy Walker Productions serves as a one-stop-shop for everything entertainment during your big day. From DJ, karaoke, MC, officiant, sound, lights, and entertainment, Big Daddy Walker Productions offers it all. Established in 2002 with a long history of entertainment services, Walker says they also stay on the cutting edge by maintain the latest in music selections and frequently update equipment and services. In fact, they just added a new service called “Foto Bomb” to their entertainment line-up. The service allows attendees of your wedding or event to submit their photos via smart phone – no application needed – to a short code and it will be submitted to a slideshow that will play throughout the event, and be added to a zip drive given to the event host at the end of the night. 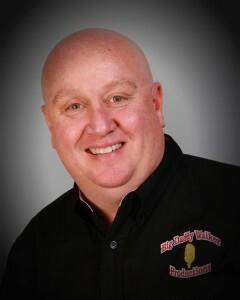 To learn more, visit www.bigdaddywalkerproductions.com.